A new resource for Messy Churches, providing a further 15 sessions focused around key 'Christian basics' themes such as prayer and reading the Bible. There is also an introduction exploring and addressing situations that have arisen in different Messy Churches. In this book you'll find 15 sessions for Messy Church that are, in the great Messy tradition, suggestions for you to adapt and improve for your own circumstances, rather than an inflexible programme to be adhered to. It may look more constructive to have a series that extends over several months, but in practice, most people find it hard to hold the narrative thread across a month's gap, so a series isn't necessarily very helpful and can be restrictive. Instead, we've taken the Christian year as a whole, offering one-off sessions, which nevertheless have themes that link them, as you'll see. The sessions have a focus on the Christian year: Christmas, Easter, Pentecost and Harvest with a nod to Rogationtide and All Saints' Day. These major festivals help us to establish key points of the Christian faith: God's creation and on-going care for the world (a theme also recognised in Session 14: 'Pets and Peace'); Christ's birth, death and resurrection; and the coming of the Holy Spirit. They also give us a chance to reflect on prayer (Session 6: 'The Lord's Prayer') and on the Bible (Session 10: 'Light up the darkness', or the 'non-Hallowe'en-but-still-lots-of-fun-dressing-up-and-doing-wacky-things' session). It's a way of being church that is for all ages, on a day and at a time that suits families in your area. It usually involves a welcome; a time of making things on a biblical theme; a celebration on the same theme with story, song and prayer; and a meal around tables for everyone. Its values are being all-age, being Christ-centred, hospitality, creativity and celebration. It started in 2004 in the Anglican church of St Wilfrid's in Cowplain near Portsmouth in the UK, comes under the wing of BRF, the Bible Reading Fellowship, and has since spread across all the major Christian denominations and around the world to at least thirteen countries. 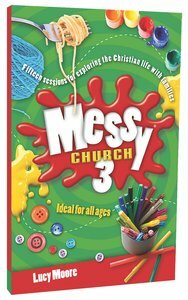 By the end of 2011 there were over 1000 different Messy Churches listed on the Messy Church online directory. About "Ideas For All Ages (Messy Church Series)"
Overflowing with creative ideas to draw the community together for fun, food, fellowship and worship, this resource book contains 15 themed programme outlines. Each outline has ideas for creative art and craft activities, meal plans and recipes for eating together and family-friendly worship. Lucy Moore is BRF's Messy Church Team Leader, an international speaker and an Associate Missioner for Fresh Expressions. Her books include The Gospels Unplugged, The Lord's Prayer Unplugged, All-Age Worship, Messy Church, Messy Church 2, Messy Crafts and Colourful Creation. She also presents the Messy Church DVD.